Uniglobe Entertainment, the boutique Hollywood based production, distribution and marketing studio for crossover entertainment between the West and the East, has acquired the global online rights to the Sikh period dramaTHE BLACK PRINCE. Releasing online for it’s digital and DVD release on 10th April 2018 to commemorate and kick-start the 2018 Vaisakhi festivities, THE BLACK PRINCE will be available in English, Hindi and Punjabi. Having secured a coveted Top 10 Box Office spot in the UK during its theatrical release in 2017, THE BLACK PRINCE narrates the true story of one of India’s greatest kings - Maharajah Duleep Singh – who was forced to live as a Christian in Victorian England. The film is a personal account of Maharajah Duleep Singh’s lifelong struggle to reclaim his rightful kingdom back from the British, as he rebelled against religious supremacy, rose against religious persecution and finally returned to his Sikh roots. The critically acclaimed film stars veteran actress Shabana Azmi as Rani Jindan, the exiled King’s mother, acclaimed singer-poet ‪Satinder Sartaaj who makes his acting debut in the film as Maharajah Duleep Singh and celebrated British actor Jason Flemyng, as Dr. Login, the foster parent for the Maharajah. Uniglobe Entertainment has a special focus in producing, distributing and marketing social awareness projects. It’s repertoire of work includes ‘1 a Minute’, the largest theatrical release for a cancer documentary screening in 600 USA theaters, to the UK Royal Family’s Rainforest Project for Prince Charles Trust. On 10th April, Sikhs worldwide will join forces to watch this little known piece of Sikh history in the form of THE BLACK PRINCE. “It is incumbent upon us Sikhs to support these stories that celebrate the Sikh spirit of courage and bravery and showcase the heroic acts of Sikhs for their allegiance to our Sikh identity”, says Gujral. Namrata Singh Gujral adds: “We hope ‪every Sikh will support The Black Prince by watching the film online, buying the DVD or both. It is crucial if more films of Sikh heritage are to be made that these films find solid community support”. 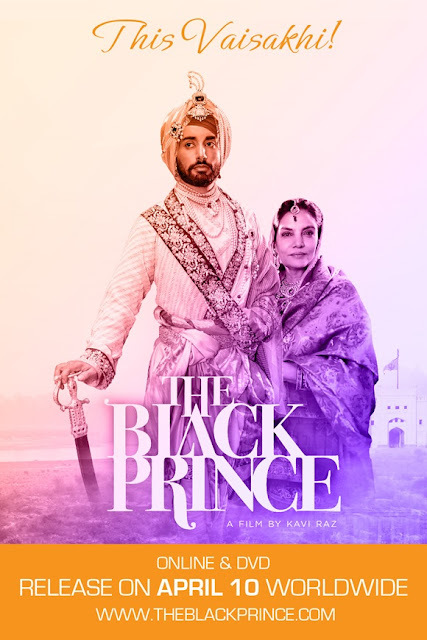 THE BLACK PRINCE is produced by Firdaus Productions and Brillstein Entertainment Partners in Hollywood, with SAGA of India handling the Punjabi and Hindi release.